As I mentioned in my last post on Copyright 101, I have just enough knowledge on the subject to be dangerous. I am not a lawyer, but an artist who was a contract negotiator and legal analyst in a former life (and who actually enjoys the subject of intellectual property). Go figure. While the last entry focused on the artist's rights to protect their creations (in that case, images of paintings), this entry comes at the subject from a different angle - what you cannot claim is your protected intellectual property. 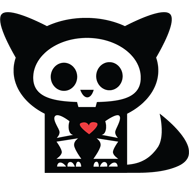 Every now and then I get e-mails from fans or friends who are concerned that my character, Skelekitty, may have been used without permission when they see skeleton animals with a similar "vibe" on the internet or in shops. I always take their concerns seriously since two of my colleagues, Art by Suzi Boneshaker and Queenie of Pocket Full of Posiez (both of whom I adore as artists and as women) had their copies of their art reproduced by a large corporation without permission (*ahem* "stolen"). Luckily, when the blatant copyright infringement was brought the the company's legal department, sale and production of the stolen images ceased. Not everyone is so lucky, especially when dealing with overseas entities or smaller companies. So this is no laughing matter, especially now when images are so easy to "borrow" off of the internet. the very idea of a 'cute skeleton animal' is not subject to copyright protection. Let's look at how the Skelekitty / Skelanimals "Kit" designs differ: Skelekitty is a less stylized (more realistic) skeleton than the Skelanimals "Kit" character. Kit and her Skelanimal pals are rounder, shorter and have just a few bones inside a black body shape. As you can see, there really isn't any crossover once you get past them both being damn cute skeleton kitties. 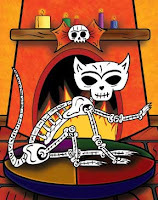 A day or two back, I received an e-mail from a good friend asking about a skeleton cat by Ladislao Loera (aka "Ladi" / Frenzy Art). Ladi happens to be one of my favorite artists, so this was a great compliment. At first glance, Ladi's skeleton cat and Skelekitty have more of a similar look and feel to each other since they are both articulated skeletons with a bright color scheme. However, they are each recognizable as separate and distinct creations. 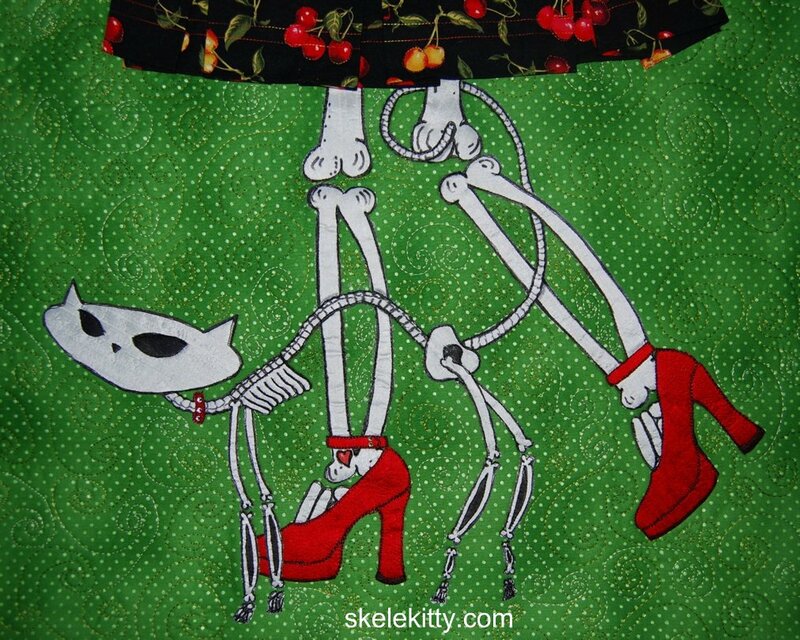 Skelekitty is modeled after the long-bodied 1950's kitties where Ladi's skeleton cat looks more like a traditional Día de los Muertos figurine (complete with Frida-esque unibrow!). Another skelefied critter Skelekitty has been compared to (and I take it as a HUGE compliment) is by my friend, artist Patrick Murillo (who is on a cruise ship heading toward Mexico with the Crafty Chica Cruise!). I adore his stuff, having purchased several pieces. 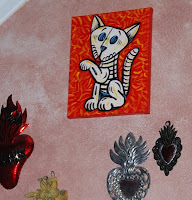 I even have one of his skele-kitty paintings hanging in my art studio! 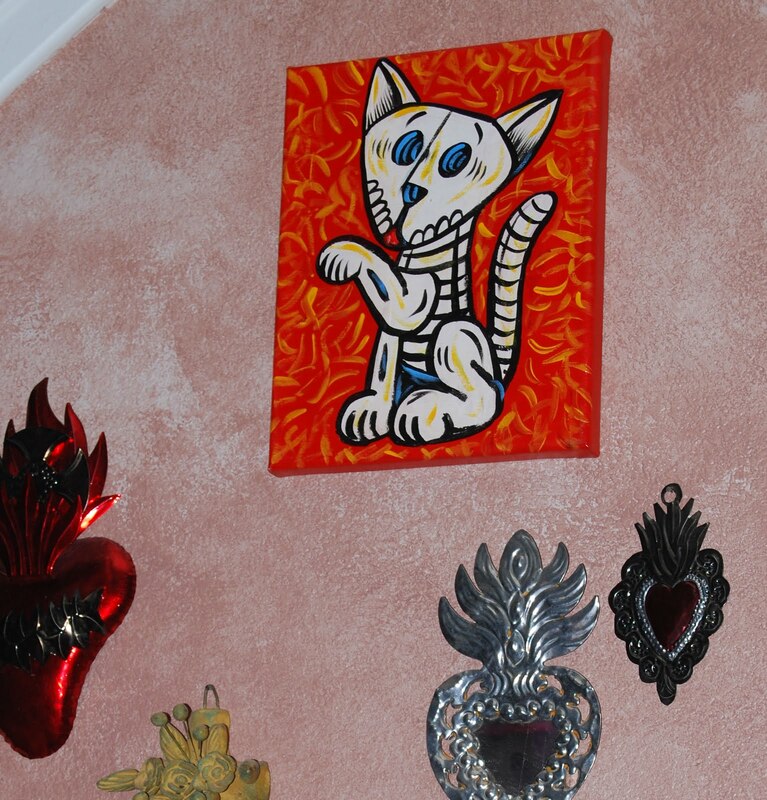 Again, by glancing at his paintings, it's clear that Patrick's kitties, doggies and skeletons are painted by Patrick while Skelekitty and the Skelecritters are instantly recognizable as "Skelekitty & Friends." OK, so you get how this works with cartoon skeleton cats (and dogs) now. What about other stuff? Late 2012 Update: Check out this real life example of outright stolen images where an artist reproduced images by two other artists, Jason Levasque (aka Stuntkid) and Marie Killen. In this case, the original images were art photographs and the "copied" versions were paintings with not-insignificant imagination and talent, but the original work was used without permission or even reference to the original artists. Although the copying artist swore the copies were homages, the online art community, his agent and his gallery would have none of it - he was drummed off social media and out of representation. 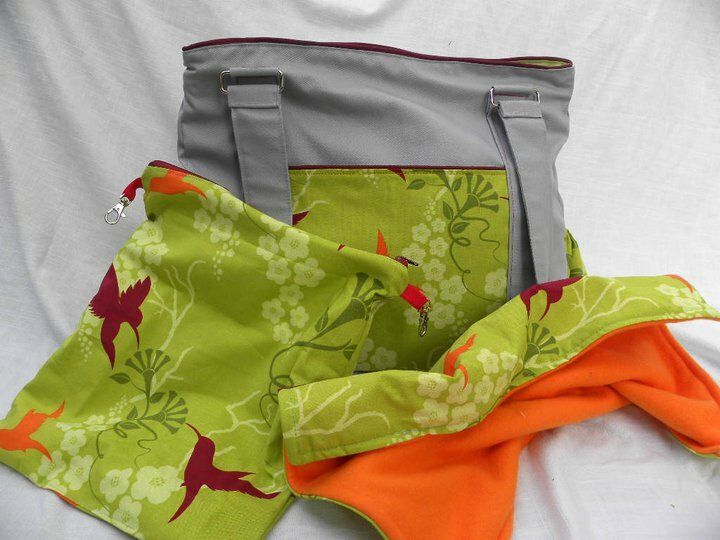 One of my good friends and a fellow member of the Corporate Rejects team of artisans, Brooke of Brooke Van Gory Designs makes totes, diaper bags and baby accessories (wet bags, changing pads, etc.). Anybody can sell diaper bags and a lot of handmade sellers do. What makes Brooke's bags special, besides her incredible attention to detail and excellent construction, is her design. The bags aren't cut from someone else's pattern - she drafts her own patterns, which are copyrightable. All of her diaper bags are sewn from her original designs, so, unless she gives permission, no-one else is allowed to sell bags of the same size, shape and with the same features. Therefore, she would have every right to claim infringement if someone were to make a bag identical to hers. Are you all with me so far? Another 'element' that set Brooke's creations apart from most other sellers are the fabrics that she uses. Most of them (with a few exceptions, like the hand-painted Rocky The Zombie collaboration bags) are constructed using commercially available fabrics with a bit of a 'punk rock mommy' feel to them. There are LOTS of skulls (really, really cute skulls; and PINK!)!! Now, while the fabric combinations that Brooke uses are definitely a part of her shop 'signature,' they are NOT something she can copyright. 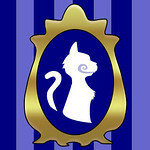 Remember where we came in with the mere idea of a skeleton cat wasn't subject to copyright protection? Yep. We're right back there. The simple IDEA of putting skulls on baby stuff cannot be and is not protected by copyright. It's not infringement, it's good old fashioned American competition!! 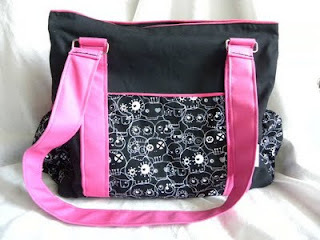 Besides, the fabrics are commercially available - heck, as long as I didn't swipe her bag designs, I could go back to sewing and make and sell a ton of baby stuff just swimming in skulls - even the same skull fabrics that Brooke uses. She could threaten to sue me until she's blue in the face, but it wouldn't make a difference, legally speaking. Don't worry though, I'm sticking to my painting and letting the seamstress extraordinaire do that thing she does so well. I will check back and if not removed withing the next 24 hours I will proceed with the next step of action to have it taken down and/or legal action. Since this woman contacted me anonymously through one of my ArtFire listings, I had to do about 2 minutes of research to find her e-mail. I responded immediately and told her that while she may indeed have a registered domain in that name, domain registration does not afford her copyright protection and since "101" is a term that has been in common usage for decades, it is not subject to copyright or trademark. Furthermore, since I had never heard of her, any similarity between the techniques in my video and her book are coincidental or are common practices. (I also suggested that if perhaps she had used a title that was a little more unique, she wouldn't have felt the need to send legally unsubstantiated threats to people who are providing simple tutorials.) Just for fun (because I hate bullies), I also looked up YouTube's policies on intentionally mis-reporting copyright infringement and found that they don't like that much, so I told her that if she flagged my video as copyright infringement I would file a counter-claim and provide a copy of my e-mail to YouTube as proof that her claim was both frivolous and harassing. I never heard from her again. I see you created a YouTube account for the express purpose of harassing me again. Perhaps you forgot my very detailed message to you in February, therefore, it is once again attached below. As promised, I have reported you to YouTube for harassment and for malicious mis-reporting copyright infringement. I actually have a background in intellectual property law, so perhaps it is YOU who should read the law before publicly and ignorantly accusing people of things which you do not﻿ understand fully. Any further contact from you on this matter will result in additional action on my part, including, but not limited to, contacting publishers, suppliers, internet providers, etc. and advising them that you are harassing me. I hope that this clears up some of the questions that I've been getting lately about what is and isn't copyright infringment and doesn't raise TOO MANY others. Now feel free to go draw your own skelefied critter or make a baby blanket with skulls on it. Nobody can stop you as long as you don't do anything naughty. Oh yeah, and remember that I'm not a lawyer and this doesn't constitute legal advice, kthxbai. THIS is awesome! Not only does it make more clear for ME what the diference is between copright and intellectual property, but it also makes it clear the whole issue with the commercial fabrics. Cause I have to admit, I am a gal with an eye for a deal, and if there is a similar item that is significantly less, I woudl totally go with the less $ then paying for a name that is negligible!!!! I definitely need to do some more research into the use of "licensed/copyrighted characters/names" (bags from Hello Kitty fabric, upcycled band shirts, etc. ), in the wake of Etsy's new Legal Dept. 's mass deletion over shops using them. Honestly, this is something I don't know about and I think Etsy Legal has gone off the deep end with their reaction. This subject may be WAY beyond me though - I have a feeling it may end up in court very soon as the handmade community grows. That's entering into a license agreement to sell copyrighted images. I license Skelekitty images for several items but if someone used the image without permission (and paying for it) you can be assured I would go after them. Of course, the point of this particular post was to call attention to things that are not copyright infringement, but competition. I'll cover licensing in another post. I LOVE competition.. it makes you work harder, and get better, and be more awesome, and want to kill competition!! excellent article and an issue I frequently have to deal with as an artist and as a promoter of local arts. 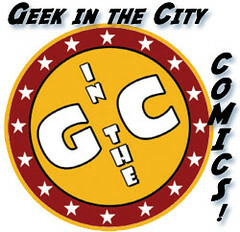 I hope you don't mind if I link to you for an article I'm writing for the local arts council blog in the near future. what I find astonishing is how some zentangle bloggers are claiming copyright to patterns they use in their finished pieces. While a finished piece is copyrightable, the elements within them are not. They are patterns that have been used for centuries in various cultures and media. Love this article, but my understanding of how copyright law applies to your bag example is different. "The bags aren't cut from someone else's pattern - she drafts her own patterns, which are copyrightable.... unless she gives permission, no-one else is allowed to sell bags of the same size, shape and with the same features." Because the bag is a useful article, and useful articles are not copyrightable, then the bag (as I understand it) can not be copyrighted. Her actual drawn-on-paper pattern could be, but the bag design itself can not be. The same way I couldn't copyright a hoodie design or a t-shirt design or a pleated skirt design. That's always been my take on it, anyway, but I'd love to hear your interpretation. Person 2 is a bully - she threatens people who are intimidated by legal matters like copyright, telling them she will sue them if they put _____ [images of a certain thing] on _______ [the items she sold]. The idea of putting any general object (hearts, skulls, tattoos, whatever) on an object (clothes, purses, art) cannot be covered by copyright, no matter how much this person wanted to squash her competition. Thanks for the response and clarification! I actually never considered the idea of someone reverse engineering a sewn object and how that could be infringement, but it really isn't so much different than something like someone buying a piece of jewelry and taking a mold of it so they can reproduce it. That's where the difficult part of intellectual property is - the copyright is on the "intangible" idea, not the object itself. So even the paper pattern isn't technically copyright protected; but the IDEAS put down on that pattern are. Thank you for your compliment, which was a thinly disguised advertisement for an IP Law firm. If you would like to become a sponsor for my blog, I would be happy to sell you some ad space. Hoshi, did you read the entire article? If your idea was not in a tangible form, there is nothing you can do since "ideas" are not protected. A copyright on art begins when the art itself is actually created. I could say I'm going to paint a skull with a monarch butterfly resting on it and you can run out and do that before I do and there's absolutely NOTHING wrong with that. If I actually create that painting, and then you go create one too - well, that's still NOT infringement. The idea of a monarch on a skull isn't something that can be copyrighted. See my paragraph above about three examples of skeleton cats, all of which are NOT stolen ideas of infringement upon each other. The only time you can say someone "took" your work, is if they copy your piece exactly, without permission and without credit. As for what to do? Well, I think you need to take a step back and consider whether or not your friend actually did anything legally or ethically wrong, and either address it with the person or re-evaluate that friendship. If your rights were truly infringed upon, then the answer is to get a lawyer, which, as I said above, I am not. If you still need additional assistance figuring out if infringement happened, then it probably didn't. If you still think it has, then you should contact a professional. I cannot give legal advice on what you should or shouldn't do.